As you may know, our daughter Katie Dow is a Beamsville resident with Cystic Fibrosis. 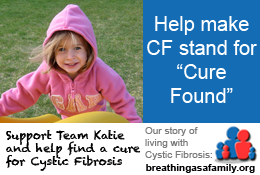 Team Katie is the group of family, friends and co-workers that are rallying around Katie to help find a cure to for Cystic Fibrosis and we are looking for corporate donations for Cystic Fibrosis Canada’s annual Great Strides Walk. Please consider sponsoring Team Katie in the Great Strides walk, which will be held on the last Sunday each May at Safari Niagara in Stevensville. Note: 100% of the proceeds from all cash and/or donations will go directly to Cystic Fibrosis Canada via Team Katie as part of our Great Strides fundraising. 887 page views in May 2012 alone!